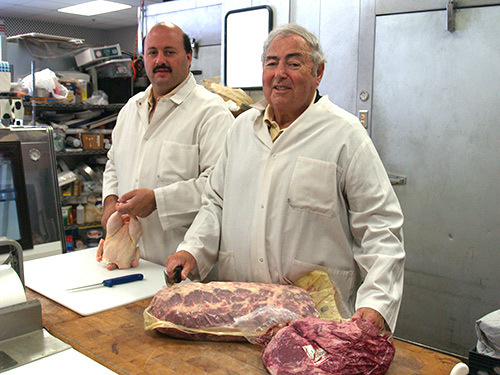 Larry Levine's Kosher Meats and Deli was founded nearly 40 years ago by Larry Levine on Central Avenue in Chelsea, Massachusetts. In 1986, Larry and his son Todd moved the business to Peabody, Massachusetts, where it is now located on Lowell Street. Levine's is the only kosher meat and deli business north of Boston and south of Montreal, Canada. Conveniently located near I-95 and Routes 1 and 128, customers flock to Levine's from throughout the Boston metropolitan area, from as far south as Connecticut and Rhode Island, and as far north as Vermont, New Hampshire and Maine. Levine's provides the highest quality meats, kosher deli, prepared foods, smoked fishes, and cheeses. The store is well stocked with all kinds of kosher groceries, and the freezers contain scrumptious prepared foods ready for you to heat and eat in your own home. Levine's prepares meat or dairy platters for all occasions. Delivery is available, but many people enjoy coming in to Levine's personally to schmooze and see who they might meet there. Levine's also provides orders to kosher meat co-ops throughout the Boston area. Fifteen years ago, Todd founded Catering by Tevya, expanding on the catering business started by Larry. Today Catering by Tevya provides elegant kosher catering for bar and bat mitzvahs, weddings, seders, shabbat dinners, graduation and confirmation parties, and all kinds of social functions. Levine's founder, Larry Levine, along with his wife Mindy, can still be found kibbitizing at the store and offering friendly, helpful advice to customers new and old. Todd, who now owns Levine's, is always there to help with your kosher food needs. In fact, Todd is the 4th generation of his family to be in the kosher meat business. Todd's wife, Simone, and daughters Hillary and Allison, can often be spotted in the store helping provide service with a smile. The motto of Levine's has always been, "We have it all!" Come visit and see how Levine's can supply all your kosher needs.